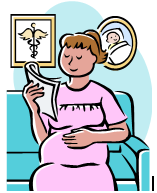 …..L et us now start to review how early pregnancy (the first trimester) is evaluated, especially in the case of bleeding. …..The embryo produces a hormone called hCG very early in the pregnancy, and later the placenta also produces this hormone. Repeating or checking the levels of the hCG every 2 to 3 days is helpful when trying to assess the viability of an early pregnancy and to see if it is normal. At a certain hCG level (between 1200 to 1500), a pregnancy should be visualized by a transvaginal sonographic exam. When serial hormone levels are being followed, it is important to use the same laboratory or else there may be different test kits used at the specific lab, and so the results may not be accurate. …..The hCG level should have a minimum rise of 50% every 2 days, and some practitioners consider a rise of 66% to better reflect a normal pregnancy. I was taught that the levels should double every 3 days, and this is the formula I have always used.